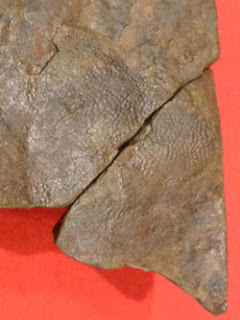 A piece of fossilized soil with imprints of a reptile's skin has been found among geological layers in Kumamoto Prefecture dating back to the late Cretaceous Period some 98 million years ago, the Fukui Prefectural Dinosaur Museum said Wednesday. The specimen obviously shows skin patterns resembling those of already-extinct aquatic reptiles or of some dinosaur species, museum officials said. This is the second instance in Japan that marks of ancient creatures' skin other than the bottom of the foot have been found, following a 2007 discovery in Katsuyama, Fukui Prefecture. While the skin patterns resemble those of dinosaurs or aquatic reptiles, the species can't be determined, the officials said. The fossil's surface bears mark of polygonal scales as well as of oblong-shaped protrusions about 5 mm long. Considering their size and shape, it is likely the skin came from the unidentified creature's abdomen, they said. It is estimated that an indentation was created when the creature pressed its body against a wet surface before sand accumulated over it and became a fossil. The specimen was found in 2001 in the city of Amakusa, Kumamoto Prefecture. At the time of its discovery, the fossil was in two pieces. One was found by an elementary school student visiting from Oita Prefecture on a family trip and the other by a curator from the Amakusa-based Goshoura Cretaceous Museum. The two pieces were identified in 2003 as components of the same fossil before the Amakusa museum asked the dinosaur museum in 2009 to study it.